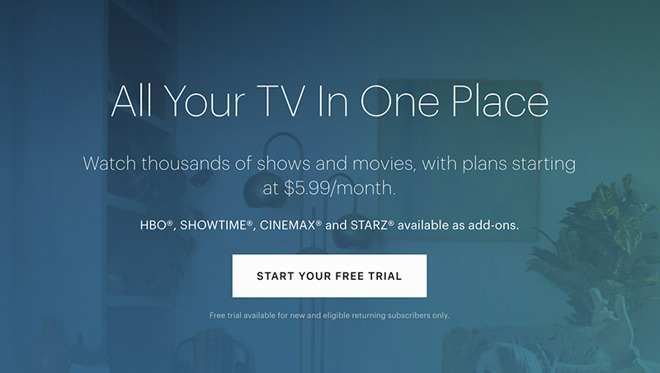 With the change, Hulu now starts at $5.99 per month for a basic subscription plan that includes access to a slate of cable television shows, popular series, movies and original content. The new price represents a $2 savings compared to the company's most recent basic offering. Along with the price cut, Hulu with Live TV is moving from $39.99 to $44.99 per month, making it one of the more pricey over-the-top broadcast viewing solutions. Hulu's version comes with 60 live and on-demand channels, including news and sports programming that complement a broad streaming library. Pricing for the provider's No Ads tier remains unchanged at $11.99 per month, while No Ads plus Live TV comes out to $50.99 a month. Users have the ability to add on premium cable channels like HBO, Showtime and Cinemax , as well as DVR capabilities and multi-screen viewing, for additional monthly fees. Hulu announced the updated subscription strategy in January, just days after market competitor Netflix raised its prices to an all-time high. The two streaming firms are in a race to secure a solid subscriber base as new competitors enter the field. In November, Disney announced its own branded service, Disney+, will debut in late 2019 carrying a trove of content that includes 21st Century Fox properties. New straight-to-streaming original series are also planned for the service. NBCUniversal is rumored to enter the market in 2020. Apple, too, is widely expected to jump into the streaming game this year with a slate of original programming contracted from established Hollywood directors, actors and producers. Recent reports suggest the tech giant aims to unveil the as-yet-unannounced product alongside a news subscription service at a star-studded event in March. Early rumblings suggested the video service would arrive in April, though more recent rumors point to a debut this fall.